Our dear loving mother, grandmother and great grandmother passed away peacefully Tuesday, December 4, 2018 at The Pines of Burton in Burton, Michigan, age 95. Bettie was born April 13, 1923 in Wisner, Michigan to the late Shelby and Bessie (Barber) Cosens. She married L.Z. Joseph Fournier in Visitation Catholic Church on October 28, 1944 and he predeceased her on May 24, 2012. Bettie was a member of St. John Catholic Church of Davison and Visitation Catholic Church, now Our Lady of Peace Parish in Bay City. 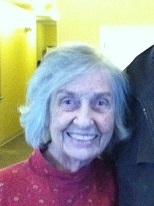 She loved spending time with her children and grandchildren. She enjoyed going to all of her grandchildren’s events and many years ago went camping with her children and her friends as much as possible. Bettie and her husband always opened their arms to family and friends. She also enjoyed spending time at her cottage in St. Joseph, Ontario and road trips with her husband. Bettie loved music of all genres and had the best up-beat personality. Surviving are two children, Cherie (Robert) Carter and Gary (Mary Ann) Fournier, five grandchildren: Paul Carter, Brian (Jennifer) Carter, Jill Carter, Matt (Stacy) Fournier and Jason Fournier and two great grandchildren, Claire and Benjamin Fournier. Bettie was predeceased by three sisters: Marjorie (Joseph) Russell, Lola (Russell) Willette and Avis (Gaylon) Willette. Bettie’s family would like to thank all the staff at The Pines of Burton for their kind and compassionate care they gave her and her family as well for the past 6 years. They would also like to express a special thank you to caregivers Matt, Theresa and Chelsea.